For the first time since 2002, the premier series finale will have a new host track – the 1-mile ISM Raceway at Phoenix, which recently completed a $178 million renovation project designed to improve the fan experience, and one which included a reconfiguration for the track’s start/finish line. ISM Raceway has hosted the Round of 8 finale since the introduction of the NASCAR Playoffs elimination format in 2014, and it has served as the penultimate race of the season every year since 2005. To get to the title race in Phoenix, though, NASCAR Cup Series drivers must navigate a 10-race postseason that will see short tracks and a road course host the elimination races. The Playoffs will open Sept. 6 at historic Darlington Raceway, whose throwback weekend has become a staple of late summer. The opening round ends at Bristol Motor Speedway under the lights, with one of the most anticipated races of the year moving from its traditional August date to Sept. 19. The Charlotte road course remains an elimination race after its thrilling debut last year, but in the Round of 12 instead of the Round of 16. With ISM Raceway moving to the championship race, the vacancy for the Round of 8 finale slides to Martinsville Speedway. The shortest and oldest track on the NASCAR circuit has a history of producing plenty of drama in its previous high-stakes Playoffs races, something sure to amp up even more with drivers having just one final chance to clinch a spot in the Championship 4. Before the postseason, the Playoffs field will be fully set and finalized in the new-look regular-season finale at historic Daytona International Speedway, a race sure to throw a dash of unpredictability into the postseason picture. Known for close-quarters racing and dramatic finishes during its second race of the season under the lights, the World Center of Racing has had a number of underdog winners in its history. Drivers could see their postseason standings drastically improve — or falter — at the 2.5-mile superspeedway in a prime-time Saturday night race on Aug. 29. • A summer stretch includes a doubleheader weekend at Pocono Raceway that will see back-to-back NASCAR Cup Series races on the same weekend. The first such instance in the NASCAR modern era, this doubleheader on Saturday, June 27, and Sunday, June 28, also ensures the season ends one week earlier on Nov. 8. Additional summer changes include a Cup Series race on Father’s Day, which recently has been an off weekend for the premier series. Chicagoland Speedway hosts the event, the first in the NBC portion of the schedule. With the Daytona summer race moving to the end of the regular season, Indianapolis Motor Speedway will serve as host of the July 4th weekend, a cornerstone on the NASCAR schedule. It hosts the NASCAR Cup Series race on Sunday, July 5. • Hosting the Round of 8 finale isn’t the only change for Martinsville Speedway. The .526-mile track will host its first NASCAR national series race under the facility’s newly installed lights on Mother’s Day weekend, May 9, 2020. 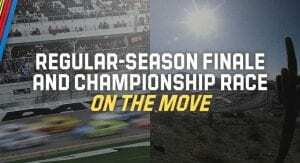 • Previously the host of the finale, Homestead-Miami Speedway’s race is slated for March 22, 2020, in the early portion of the regular season. The 1.5-mile track with variable banking produces some of the best racing all year. • NASCAR goes West earlier this year, with the three-race West Coast swing starting immediately after the season-opening Daytona 500, with Las Vegas Motor Speedway hosting the second race of the season, followed by Auto Club Speedway and ISM Raceway. • The four final races of the regular season are designed to test the mettle of NASCAR’s top drivers on a variety of courses. That four-race slate includes a wide 2-mile oval (Michigan), a road course (Watkins Glen), a fast, 1-mile concrete track (Dover) and a 2.5-mile superspeedway (Daytona).